Like many people, I too had seen all the other films available on the airplane and reluctantly decided to watch The Bucket List starring Morgan Freeman and Jack Nicholson. Like a particular subset of those people, I too created a bucket list. In the years since then, I have come to realize that there’s a hole in my bucket! I started with a list of 30 items. I’ve managed to whittle away about 10 of them and I still have 30 unfinished bucket list items. See the thing no one tells you about bucket lists is that you’re not supposed to complete them. You tick off one item and in the process you grow and discover at least one more inspiring thing you ought to do before you kick the proverbial bucket. The point, perhaps, of the bucket list is its creation more so than its completion. All of which leads me to Iceland. After landing in Reykjavik in December, it doesn’t take long to recognize that Christmas is the national sport in this country. Staff at the airport are decked out in your uncle’s worst Christmas sweater, reindeer antlers and red noses – truly a sight for the red eyed traveller. Entire neighbourhoods in Reykjavik appear to have been hit by Christmas light bombs and background Christmas music soon becomes so ubiquitous that it is eerily unsettling when any part of your day is marked by a prolonged absence from a Christmas song. If you are anything at all like me, some 90% of the knowledge you possess was derived from Disney’s the Mighty Ducks trilogy: there is no defence in hockey for the Flying V, the triple deke is the greatest of all dekes and Iceland is very green and not covered in ice and snow at all. Except Iceland is covered in ice and snow, at least at this time of year. Approaching the Blue Lagoon directly from Keflavik Airport (conveniently, the Lagoon has luggage storage facilities), you would be forgiven for mistakenly believing you’ve recently landed on the moon; such is the raw, isolated beauty of the Icelandic landscape. Black volcanic ash protrudes through the thin layer of snow blanketing the lunar landscape. It’s 10.30am and eerily dark outside. Running barefoot through ice in a desperate attempt to plunge into the geothermally heated waters of the lagoon is perhaps the closest I will ever come to joining the Polar Bear Club, but the dichotomy between body: warm, relaxed and at peace, and head: frozen, pummeled by hail and assailed by Icelandic winds is truly a must experience. Of course, for those who can’t handle the cold there is a bar located in the centre of the lagoon serving beer, wine and spirits sure to warm the body, if not the soul. Perhaps to combat the cold, harsh conditions of winter our hearts must be warm. Though I possess no empirical evidence to support this, if it’s not true of Canadians I’m sure it is of Icelanders. It’s puzzling, if not alarming, the first time a car stops to let you cross the street when you are nowhere near a designated traffic light, stop sign or pedestrian crossing. Eventually, the realization sinks in that this European destination is not yet jaded by tourists, genuinely appreciative of your visit. It’s expressed in the friendliness of locals, including waiters who regularly remind you that it is not customary to tip in Iceland, as waiters and waitresses are paid a salary commensurate with the (lofty) cost of living in Iceland. At this time of year, Iceland is immersed in 20-21 hours of darkness daily, the true reason behind the all encompassing embrace of Christmas by Icelanders. Though like a great love, there is no correlation to be found between the duration of the daylight and the quality of it. In December, Iceland’s sunlight is a treat for photographers, never quite brightening to that hot white light that makes everything look ordinary and uninspired after 10am. 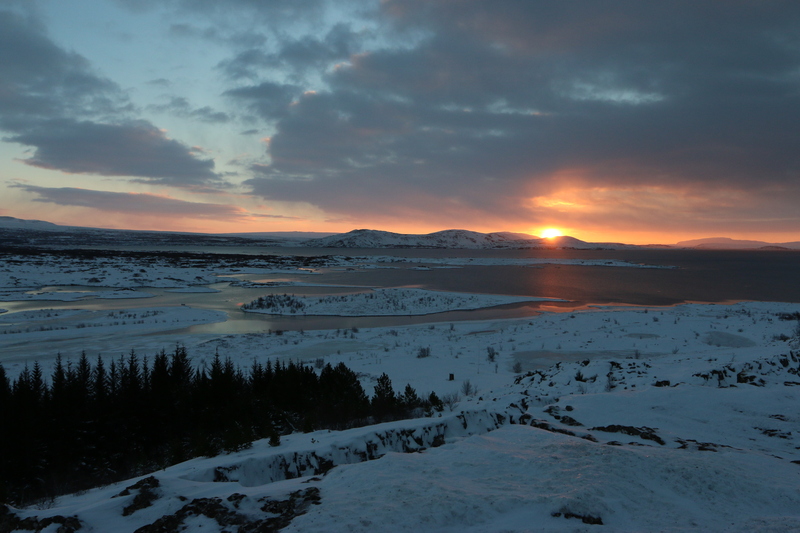 þingvellir National Park is an ideal location to see the sun breach the horizon around midday. Like a moody teenager, the sun rises at noon over þingvellir National Park in Iceland, December 2014. 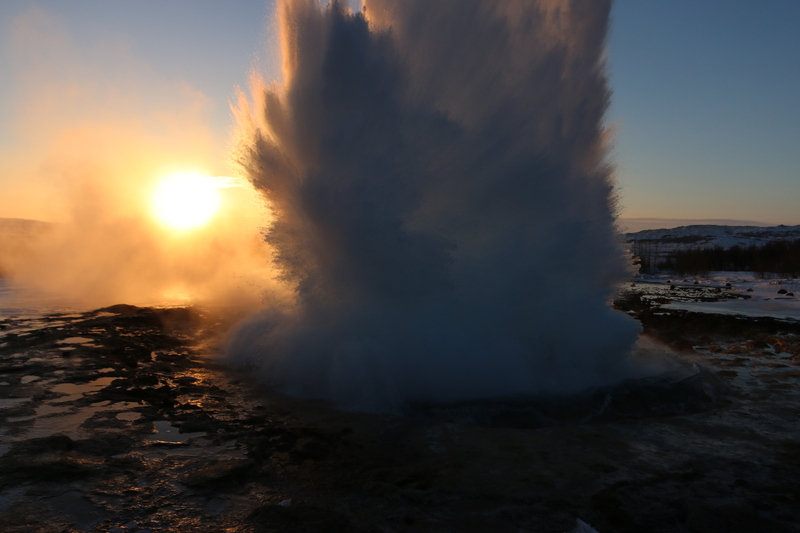 Geysir exploding in front of Iceland’s perfect, if ephemeral, golden winter sun. There are innumerable waterfalls, exploding geysir’s, endless hikes, glacier walks, ice climbing excursions, helicopter volcano tours, infinite geothermal spas and plenty of restaurants/bars to max out your credit card in, but you would not be coming to Iceland in the winter if you were not hoping to catch a glimpse of the Aurora Borealis. There is a great void of information on the internet as pertains to spotting this majestic symphony of lights from Reykjavik, and I perhaps learned too late that the best way to accomplish this would be checking into a hotel, isolated from light pollution, like Hotel Ranga (where you will be woken up, if asleep, should the Aurora come out to play). 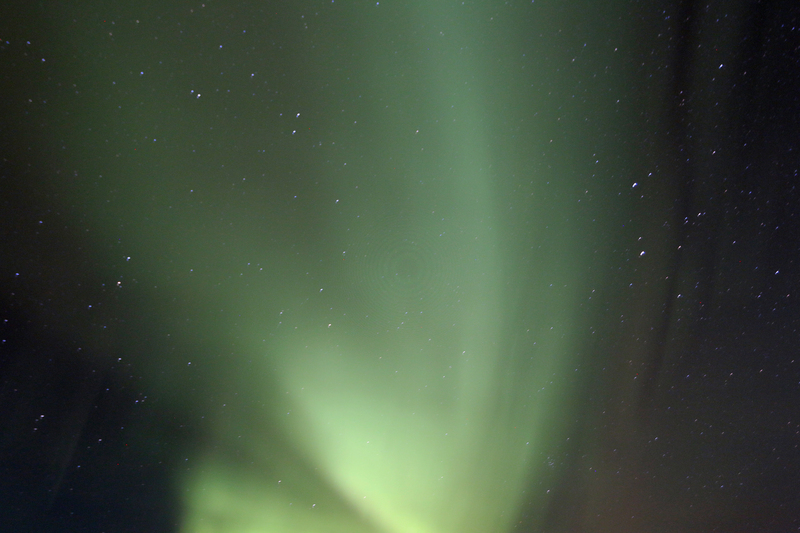 So I, like many people, lined up for coach tours departing from Reykjavik to hunt the Northern Lights. I learned, from time spent in Africa, that a great supply of patience and endurance is required to have even the faintest chance of seeing any kind of unique natural phenomenon. Africa taught me that life rewards those who persist. So I persisted. I stood outside with my camera on a tripod, fingers numb, toes burning from the cold, knees rattling and eyes transfixed upon the sky. Over three nights and seventeen hours, I waited and waited and waited. Because Africa taught me one more lesson, that all of that persisting and all of that patience rewards you with an indelible feeling of triumph when you finally get that picture. With special thanks to the travellers from Huddersfield, England who shared photography tips with me on an unsuccessful expedition. Stay: Centerhotels Thingholdt for its ideally situated location, esthetically appealing architecture and modern rooms. 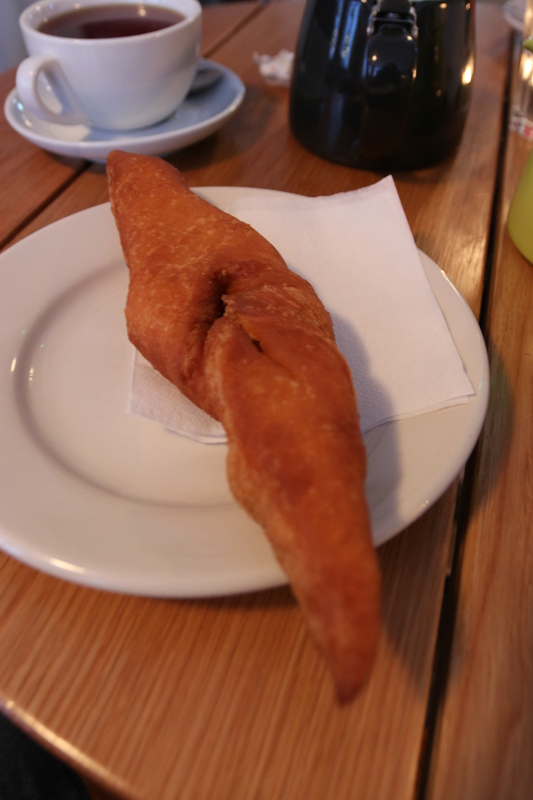 Try: The fish soup at Fish Restaurant, warming up with a coffee at Cafe Laundromat, the burger at Jorundur Gastropub, absolutely anything at Sjavargrillid Seafood Grill, fitting in with local hipsters over cocktails at Kaffi Barinn and an Icelandic Donut at Kaffi Brennslan. Don’t: Count pennies. You will spend a small fortune. But it’s worth it.